I am writing this on the morning after our concert, I am still singing bits of that wonderful music and am sure it was one of the best things we have done. I spoke to a number of people who were in the audience, including a former member & chair of the choir, who said the same thing. Andrew always manages to get us to raise our game and produce some joyful and exuberant singing! I really enjoyed the soloists. So lovely to have Bethany & Helen with their very local family connections and to welcome Tim back with his powerful voice. I think the bravery award should go to Will, our tenor, for stepping in on Monday having just got back from a holiday in India and not being fit. He also had not sung this in English before, or American! Fiona and her orchestra also played beautifully. And what about those trumpets and timpani?! From a choir member who wasn’t able to take part. We enjoyed the concert very much and the music was certainly appropriately Christmassy. We moved around so that by the 2nd half we had the perfect acoustic position on the balcony. It was very marked how everyone gained confidence during the evening and it was a really wonderful evening. We also felt that the audience was engaged and enjoying the music. I was the first time I had the opportunity to hear the choir and watch, and I was very impressed! From a member of the audience. We both thoroughly enjoyed The Christmas Oratorio. The choruses and chorales were excellent and clearly enjoyed by the choir, too. Thank you EDCS, keep ‘em coming! “Time flew past like a whirlwind……………………….” and that’s exactly how I felt, sat in the audience on the evening of Saturday July 11th, enthralled by the Choir’s uplifting performance of Andrew’s beautiful ‘Songs of Love’ – I didn’t want it to end and really could have listened to it performed all the way through again. It had not been a very long Summer Term and even with the addition of a day’s Workshop there was a lot to learn within a short time, but, most definitely, once the superb Jazz Quartet entered the scene the whole piece came alive and by the evening’s performance – and certainly after Andrew’s charming introduction! – YOU ALL had the audience in the ‘palm of your hands’………. I have warmly thanked Roger Lambert on your behalf, for his pleasantly brief but to the point, description of the work of ‘ShelterBox’ – our chosen Charity to benefit from this Concert. Many choir and audience members viewed the actual ShelterBox on display and I’m quite sure that being able to witness the simple Green Box enclosing the emergencyshelter/life support utensils that the Charity produces and delivers across the world, prompted the fantastic exit collection of £491.09 (since made up to £500) – which, together with a donation from EDCS funds of £500 means a total donation of £1000 is on its way to ShelterBox H.O. in Helston, Cornwall. 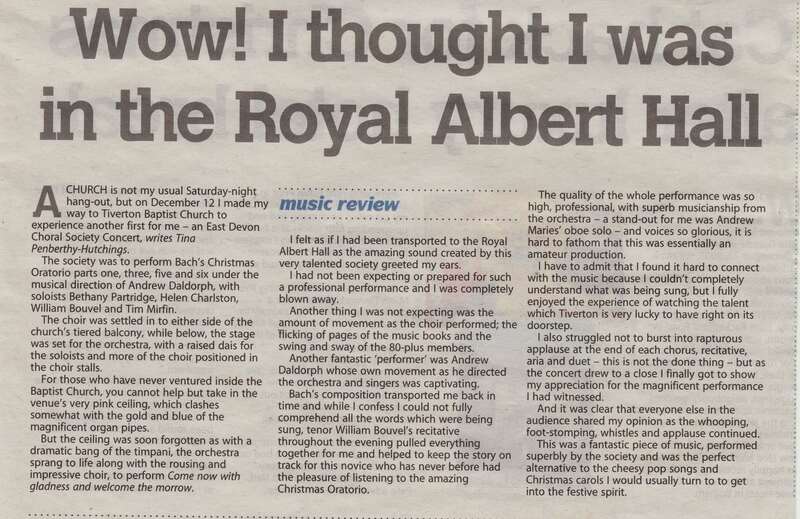 I’m sure you will all be thrilled with this excellent result – achieved by staging this Concert as the high spot of our term’s work – and we ALL enjoyed ourselves as well!! 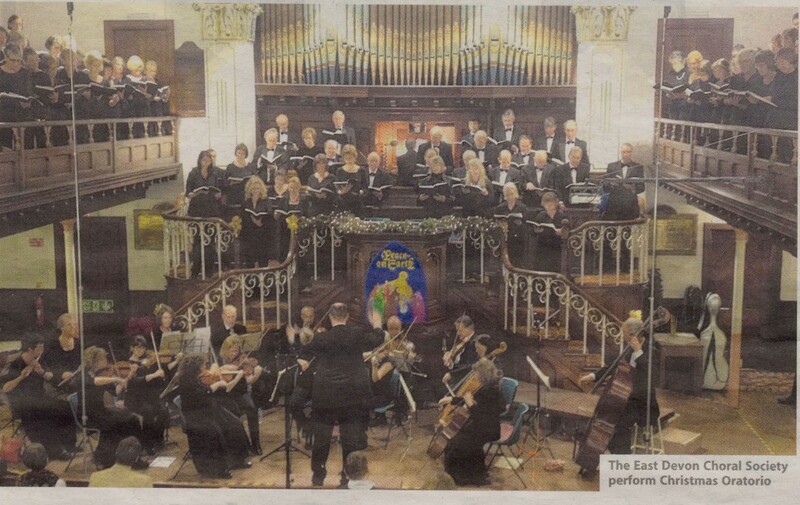 The concert consisted of two works, The “Nelson” Mass by Haydn and Dixit Domine by Vivaldi performed in Tiverton baptist Church to a large appreciative audience. Everyone seemed to enjoy the evening, one member of the audience thought it ended too soon. There were many comments about “the fantastic Bass soloist”.